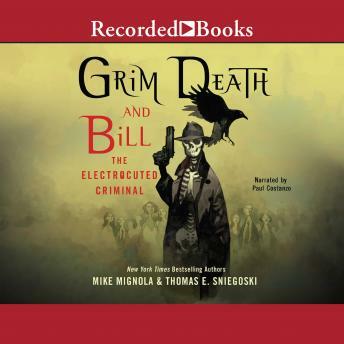 From NYT bestselling authors and illustrators Mike Mignola and Tom Sniegoski, come two thrilling anti-heroes: Grim Death and Bill the Electrocuted Criminal battling against crime. An uneasiness festers upon the city streets, threatening the peace and safety of law abiding citizens. A war is escalating, and it seems as though the good and righteous are being crushed beneath the unholy weight of evil's onslaught. Organized crime is spreading in an unchecked reign of terror. Until a mysterious agent of retribution rises up from the shadows to challenge the villains. A lone figure, clad in a slouch hat and clothes seemingly stitched from the blackest shadows, masked in the guise of a skull-faced death-a Grim Death-emerges with guns blazing. With him, a wronged ex-con clad in the striped costume of his misfortune-Bill the Electrocuted Criminal. In this beautifully illustrated 1930s Pulp-style novel, two dark new characters by New York Times bestselling author and comic book writer Tom Sniegoski and New York Times bestselling, award-winning creator of Hellboy Mike Mignola who also worked on the Hellboy movies with Guillermo del Toro, take to the street to fight the growing infection of organized crime. Grim Death and Bill the Electrocuted Criminal are not your average heroes, but they want justice.